There is very little which is more exciting than the anticipation of welcoming a tiny new member of your family into the world and the preparations can be lots of fun too. However, the choosing of nursery furniture for your newborn can be a real challenge and once that task is complete, the fun can really start. Choosing the decor of the nursery can be heavily influenced by something as simple as finding a gorgeous set of crib blankets. When searching for bedding for a baby crib, looks are clearly important; however, there are certainly other aspects to consider in ensuring the right choice is made to keep the new baby snug, warm and safe. In this article, you’ll learn some of the critical factors to pay attention to while buying crib blankets for babies. Since babies cannot manage their own body temperature effectively, it is critically important that they are kept neither too warm nor too cool. Appropriate clothing, depending on the weather and also taking into account being indoor or outside is obvious. However, it is sometimes forgotten that providing appropriate bedding can make a huge difference in the comfort and safety of your newborn while they sleep. A cotton crib blanket is an excellent first buy for a new baby. As they are woven from natural cotton fibers, they are soft and gentle on the baby’s skin. Aside from that, they are also great at keeping the baby warm when it’s a cold and also cool when it is warm as cotton is a fantastically versatile material. 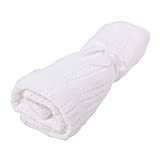 Cotton crib blankets will wick moisture away from the skin ensuring that your bay will stay dry and warm when sleeping. Additionally, cotton crib blankets come in many different colors so you are sure to find a great variety of choice which will match your baby’s nursery perfectly. Extra Large Sizing 30" x 40"
Reviewers are very complementary to this product, they are reported to be soft and stretchable which make them suitable for swaddling or wrapping your baby tightly to ensure they feel secure while asleep. Some reports suggest the crib blanket is a little thin which may mean you might consider adding a warmer blanket if the temperature is cool. 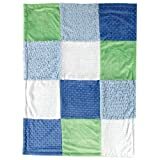 This type of crib blanket is great either used alone or to add a little more warmth when combined with a plain cotton crib blanket. The unique construction of this type of crib blanket means that the waffle type weave forms little raise squares which help in trapping warm air next to the baby while they sleep. A cozy night is guaranteed with this blanket. Usually made from cotton, this type of crib blanket is machine-washable and for the environmentally conscious, organic cotton types are readily available. 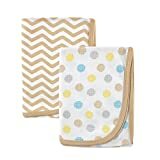 Again, this type of crib blanket is available in many colors such as the Niuniu Daddy Cellular Baby Blanket, which is an Amazon own-brand product. Lightweight and breathable, Soft and warm, create a comfortable space for baby. Its size is also very appropriate,35.4"*27.6". Tight weave won't snag little fingers,and the soft fabric will not hurt the baby. Colorful and varied, the choice of space is very large. We have the colors that most stores do not have. We have yellow, blue, red, green, pink, white, purple, brown. It is enough space to save, when you do not use it, you can use a ribbon tied into a volume. The packaging looks good, wrapped in gorgeous bow ribbon, send it as a gift is a good choice. Cellular crib blankets are the perfect choice for covering your little one during their daytime nap. Since a baby napping in the daytime is likely to be wearing a few more layers than at night, this crib blanket will provide an appropriate extra layer to keep them warm but not too hot. If you are looking for a crib blanket to give a pop of color and interest to the nursery, the choices are wide and varied. Many parents choose to have a special blanket created from pieces of material which hold memories for them, perhaps a piece from a wedding dress or a blanket used when one of the parents was a baby. Books of patterns like this one, The Big Book of Baby Quilts have an array of patterns to choose to allow you to undertake a fun craft project. Generously Sized at 30 X 40"
SOFTER FOR MORE SNUGGLES. This super soft blue baby blanket is made from plush Faux Mink, which makes it ultra soft for tummy-time with babies, and snuggly for toddlers. VERSATILITY FOR PEACE OF MIND. It's 30"x 40" - perfect for tucking your little one into a stroller, or stashing in a diaper bag (and using as a makeshift changing pad if needed) and it's machine washable without pilling. CLASSIC DESIGN FOR ANY BABY DECOR. The clean and simple design goes with any nursery, and won't date itself with designs/images that may fall out of fashion or become scratchy. STRESS-FREE GIFT. Be the champion gift giver, whether it's for a little one or for Mom with these ready-made baby shower gifts. 100% RISK-FREE. We're a family business and want to ensure you're delighted with our baby blankets for boys. So try our softest blue baby blanket, and if you're not completely satisfied, simply return it for a full refund - no questions asked. You deserve to be comfortable - and worry free. The Luxuriously Soft Baby Blanket is classically designed to suit any baby decor. Although this type of crib blanket can be beautiful, take care to select items which are mainly man-made fiber as this is kinder to your baby’s delicate skin. For safety, care should be taken to remove a layer from your baby’s crib if the temperature in the room feels warm. The rule of thumb to follow with all bedding is that cooler is far better and safer than too warm.